I’m incredibly lazy when it comes to my hair. I have no problem spending an hour or two on my makeup or perfecting elaborate eyeshadow looks, but every time I need to primp my hair, I always take the easy way out. While I love the way it looks after it’s been straightened or curled (big barrel curls being my favorite), quite frankly, that just requires way too much effort. I have to really be in the mood to do that or have a fancy occasion to attend, which rarely happens since I’m selective about the engagements I attend. So what’s a girl to do? Well, one of my favorite hairstyles to do when I can’t be bothered is a sleek bun. It doesn’t take long to do (2 minutes, tops) and is really simple to achieve no matter how skilled you are at hair. I absolutely love doing a bun when I’m rocking my natural hair or I’m really limited time, which, to be honest, is every day. The simplicity is the reason why I don’t see myself cutting my hair again, like I did as a freshman in college when I went natural. But while my love of bun knows no limits, I have to admit, they can induce headaches, especially if my hair is pulled back a little too tightly. Something about the way the scrunchie snags at my hair has triggered head pain in me before, numerous times. At first, I didn’t know why it was happening, but eventually, I out two and two together. But despite this major drawback, I couldn’t stop wearing buns altogether. I did, however, limit how frequently I wore them. That is until I found Invisibobble, The Traceless Hair Ring. Thankfully, I was able my hands on some again (from Sephora), so I tested it out again for this column — and now I covet them like most prized possession. They come in a range of colors, and each package comes with three Invisibobbles for $8. While it may look a bit childish, this revolutionary invention has worked better than any other hair ring I’ve ever tried. It holds my hair in place for hours on end without pulling at it, and it doesn’t leave those annoying creases or bumps in the hair. 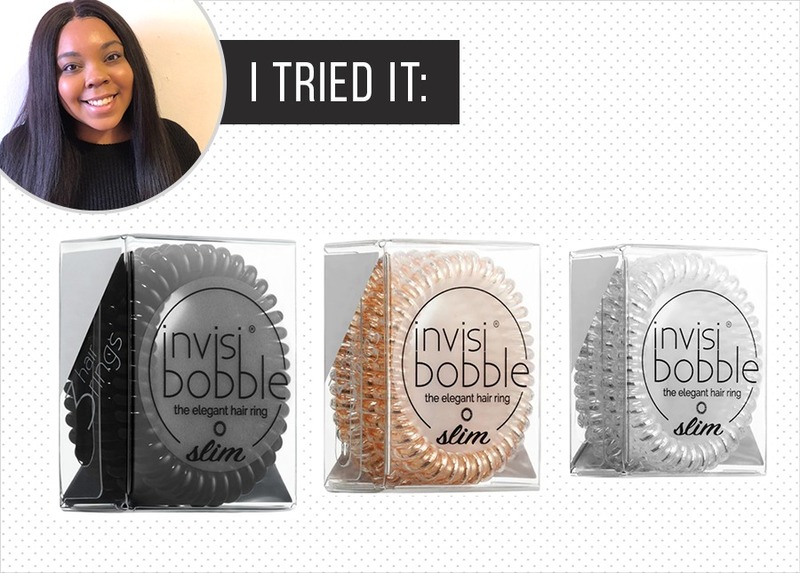 If you have a sensitive scalp like me and often get headaches from wearing your hair up in ponytails or buns, I cannot recommend Invisibobble enough.